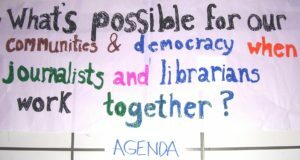 What’s needed to create new partnerships among librarians and journalists that support community engagement? Journalism That Matters is conducting research and expects during 2012 to develop a resource center — virtual and real — and gatherings to help answer that question. “To get started, we need a ‘place,’ both a physical place and a virtual place where interested journalists, librarians and citizens can go to learn more and contribute,” commented Michael Starks, of Zionsville, Indiana, one of the webinar organizers. As a first step, two JTM board members, a former president of the American Library Association (ALA) and an active participant in community-engagement efforts in an urban Seattle library system produced a workshop at the American Library Assocation’s annual meeting in New Orleans. Be patient — in the first minute there is some silence cross talk with the presenters; then the workshop begins. If your browser or computer will not launch the Adobe Connect presentation, you can download an Adobe Acrobat PDF version of the slides and the accompanying downloadable MP3 audio track. You can then step through the slides and manually sync it to the audio file. You can also ready the text of the live chat comments from participants. The presenters (in speaking order) are Marsha Iverson, of the King County (Wash.) library system; Nancy Kranich, past ALA president and library-journalism lecturer and researcher Rutgers University; Mike Fancher, retired executive editor of the Seattle Times; and Bill Densmore, Reynolds Journalism Institute researcher. Fancher and Densmore are both on the board of the non-profit Journalism That Matters. Kranich is also founder and leader of ALA’s just-forming “Center for Civic Life,” supported by the Kettering Foundation. In the webinar, Iverson sets the agenda for the challenge — identifying the common purposes of journalists and librarians. Kranich returns to British and early-American history to establish that libraries originated from some of the same desires to provide free civic information to which journalism aspires. Fancher describes recent work of the Knight Commission on the Information Needs of Communities and his related white paper. and Densmore overviews the proceedings and insights from “Beyond Books,” an April 6-7, 2011, Journalism That Matters gathering at the MIT Center for Civic Media. At your library on in your work, please describe any collaboration between news organizations and libraries, or journalists and librarians, that you’ve organized or been part of. Please be specific so we can follow up. How did it work? 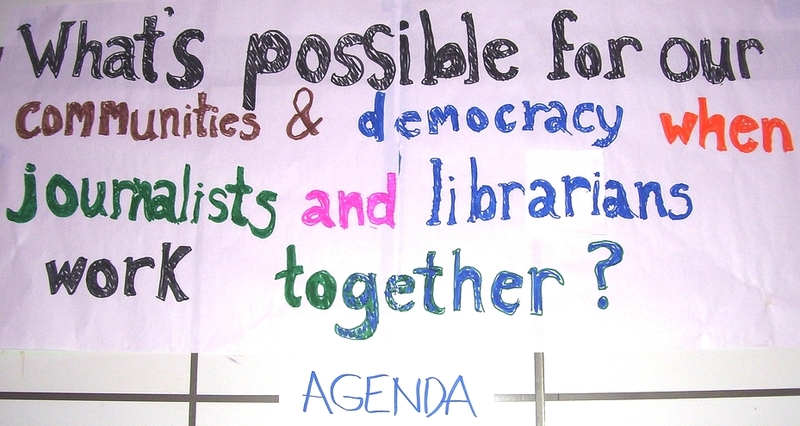 What do you see as the biggest opportunity, and the biggest challenge to journalist-librarian collaboration? How would you capitalize or overcome? •The Local East Village, Carter Journalism Inst. This entry was posted in Post-conference reflections and tagged ala, beyondbooks, biblionews, civic, collaboration, community, engagement, journalists, librarians, libraries, MIT, webinar. Bookmark the permalink.